-JdK- Let us be absolutely clear: we like this bike. It looks good, we would like to have it in our shed and trash it on the road. We are quite sure it will be lots of fun. Flat tank OHV Nortons are brilliant. It is for sale at HD Classics in Belgium and the problem is that it is priced at 57.000 euro. The advertiser suggests that the machine is a 'rare 1927 M25 TT racer' that was owned and raced by an Austrian chap named Rupert Karner. Rupert Karner was not in the same league as Stanley Woods or Jimmie Guthrie and we had to find him on the internet. Rupert indeed raced motorcycles but he killed himself riding a D.S.H motorcycle on the 20th of May 1928. 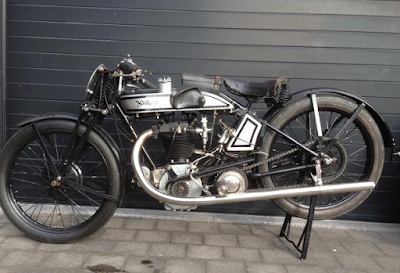 Perhaps Rupert had the habit of crashing motorcycles because the engine of this Norton (number 33388) left the factory in a Model 21, delivered on the 30th of March 1927 to the Demont Freres in Switzerland in a frame numbered 26439. The current frame bears number 30195; we cannot find it in the records but it bears all the hallmarks of a Model 18 frame. Off course it could be true; Rupert obtained a genuine Model 25 Norton in 1927 (which would have been exceptional; few M25s were sold in 1927 before the CS1 arrived), crashed it almost immediately, replaced the frame with a Model 18 frame, found an almost new 1927 Model 21 engine, rebuilt the lot, put it in the shed and killed himself a few months later on a D.S.H motorcycle, whatever that may be. This bike was on our website before. It was for sale for a hefty 42.500 euro in 2014 in Germany and now has found it's way to Belgium. As usual, each new owner adds a bit to the story and we would not be surprised if it is advertised next year as Stanley's 1927 TT winner. 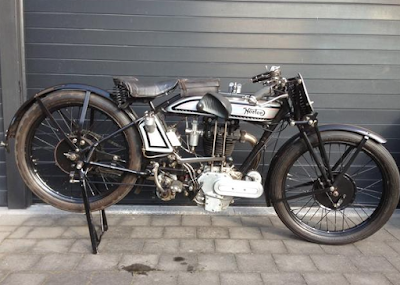 As said, we like this Norton but it should perhaps be advertised as a '1927 racer replica built from very nice bits by someone in Germany'.